We are big believers that when you don’t have access to fresh produce, use frozen! Frozen fruits and veggies often have just as much nutrition as their fresh counterpart. We are lucky that we can get most things fresh year round, but when they aren’t in season they are usually more expensive and also the flavor and texture usually isn’t as good! We will on occasion buy frozen spinach to use in different recipes. 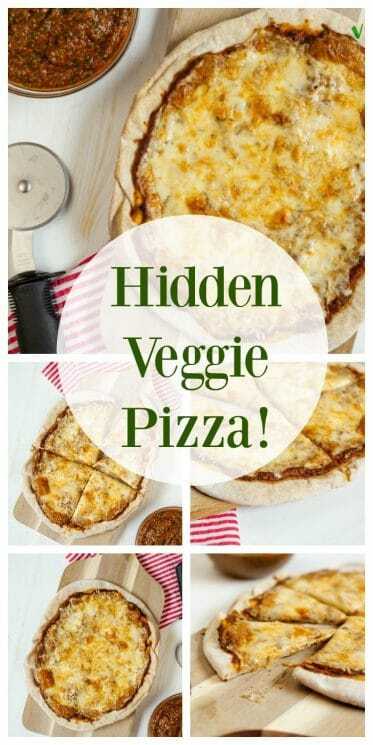 This Hidden Veggie Pizza Recipe was inspired by how to use a box of frozen spinach we needed to use. And the result was amazing – our kids loved it!! We added our frozen spinach with a jar of our favorite spaghetti sauce in our Blendtec. We feel like when you are making recipes like this, having a high powered blender is such an advantage because it blends things so smooth. Then I added some mushrooms and pureed those in as well. Sometimes kids have texture issues with mushrooms, and so adding the flavor in the sauce is a good start! We used our homemade crust recipe added our sauce and cheese (because plain cheese pizza is my kids’ favorite) and baked it up. 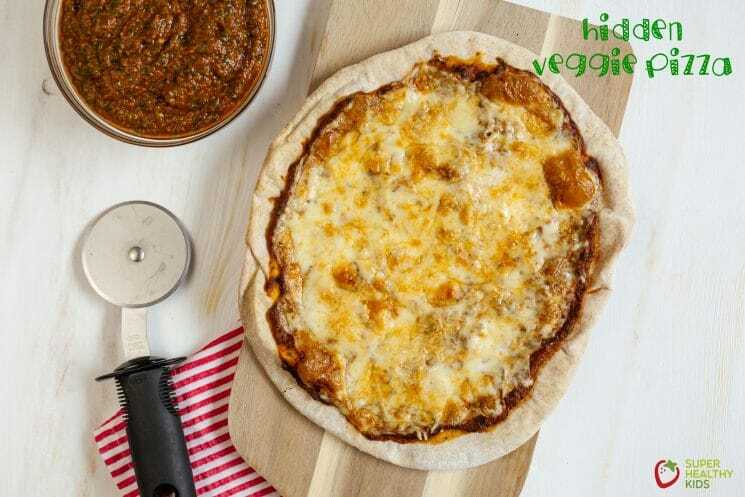 Rather than having veggies on top of our pizza, sometimes it is good to switch up how you serve them. We know it is important for kids to learn to love fruits and veggies, but we also think it is good to try different ways to get them used to flavors and textures. In a pizza sauce is a great way! They know it’s there because I tell them. They got a healthy dose of spinach and mushrooms and everyone was happily eating pizza! 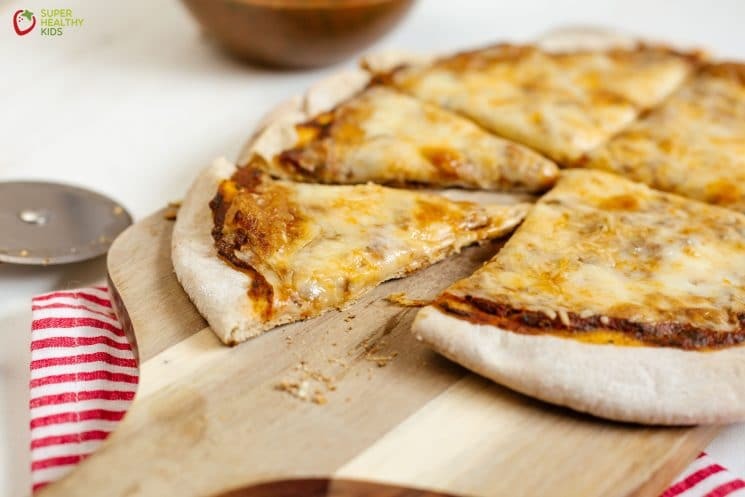 Pizza is a meal that is really fun for kids to be involved in. We usually give each of our kids some dough and let them make their own pizza. I also give them toppings in case they want to add more veggies, or pepperoni to their pizza. Double dose! 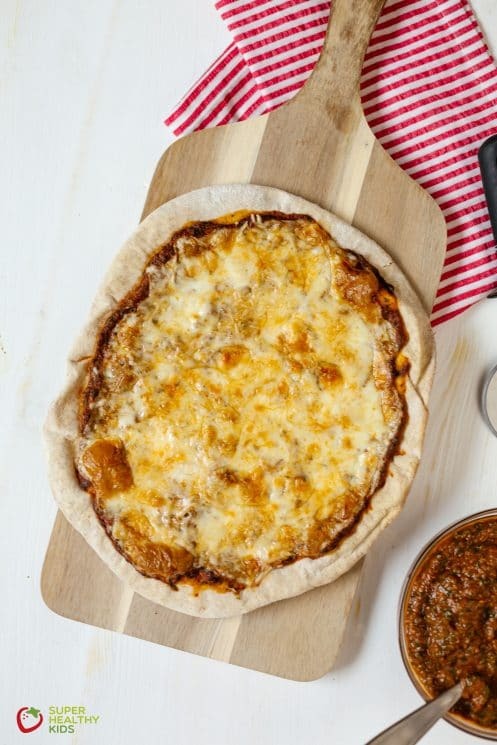 Make this for your next Friday night pizza night! Punch dough down, let sit on pizza pan for a few minutes. Then roll out. Let sit again for 10 minutes. Preheat oven to 425 degrees. 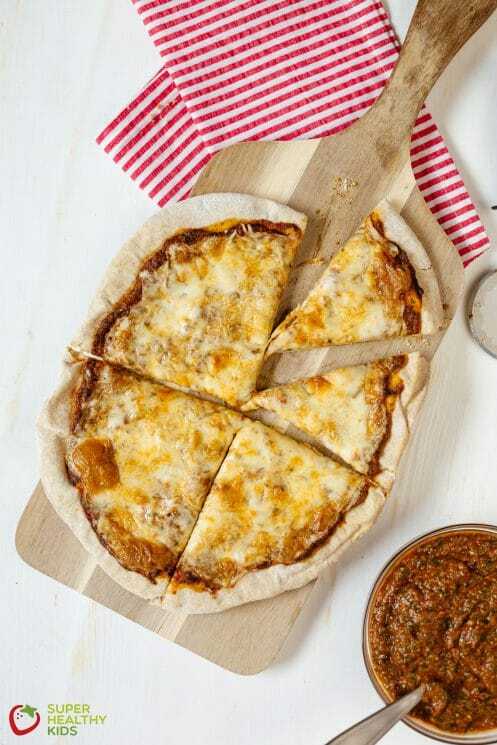 Roll out dough on pizza pan. Cook at 425 for about 10 minutes. In a high powered blender, blend together spinach, mushrooms, and spaghetti sauce. 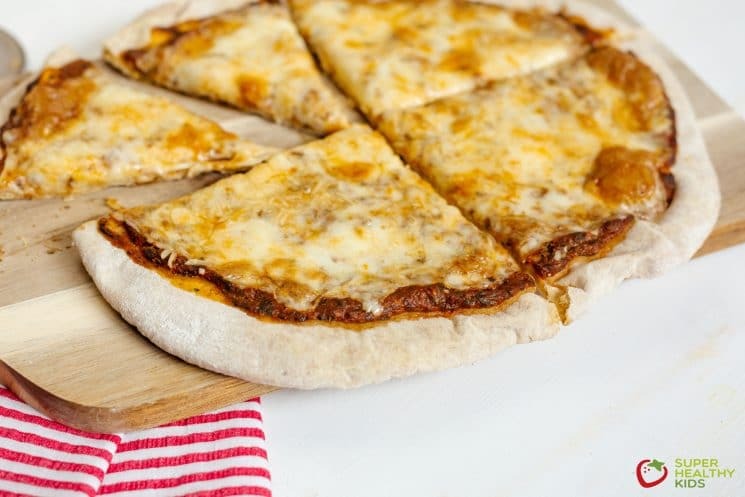 Spread sauce on the partially baked crust. 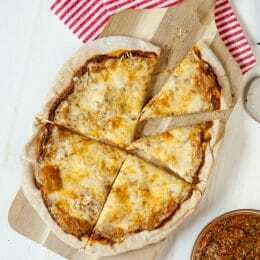 Top with cheese and other desired toppings. Bake for 10-15 minutes or until cheese is melted and bubbly (for the best results, bake on bottom rack). I love spinach!!!!!! Two of my favorites with the frozen kind are spinach dip and spinach quiche! Can you make it healthy for us Amy? I like a challenge Wendy, and I LOVE spinach quiche too. I’ll see what I can come up with. I’ll try spinach puree next time. Thanks! I haven’t stopped by in a while and wow!! You have so many new yummy looking recipes! I will be trying a few of these! I use frozen spinach all the time. love it. I’ll have to try blending it in pizza sauce. I actually make a great spinach quiche with a brown rice crust. Sometimes I’ll use barley or oat groats or any other leftover grain I have on hand. Turns out fabulous. What a great idea!! I am going to do this…maybe my little Taco Man will eat healthier if I just trick him into it!! Thanks Amy! Did you use fresh mushrooms or canned? I love this idea! Heather, I have tried to email you so many times since you’ve been commenting on my site, and my emails always get rejected. So I hope you come back here for my responses. I don’t want you to think I’m ignoring. But in a simple answer… fresh! I love fresh mushrooms. I used to make this in college all the time for my roommates. It was one of my favorite meals! What a great healthy treat for kids! That would totally work Kim. In fact, I usually put the whole fresh spinach leaves layered with our lasagna. It turns out fine! Can I use kale in this recipe of I don’t have spinach on hand? I tried this using the frozen spinach, but the sauce turned an obvious green colour. No fooling the kids with this one! But I could hardly taste it, so I may do it again for my husband and I.